and cultivate a strong local food community. Knuckle Down Farm is a small-scale organic market garden sitting on a quiet back-channel of the Trent River. We grow over fifty varieties of vegetables, herbs, and flowers with care and mostly hand tools. Our Community Supported Agriculture (CSA) shares give you a direct connection to the local farm where your vegetables are grown, and with the farmer who grows them. They also give you fresh, delicious, organic produce all summer. Weekly veggie shares can be picked-up from the farm near Stirling, Frankford, & Campbellford, or from a pick-up spot in Toronto’s West End. 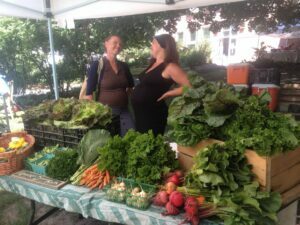 Every Thursday, Jenny brings vegetables she plucked from the soil only hours earlier to the Dufferin Grove Farmer’s Market in Toronto. Stop by her booth and say hello! Knuckle Down Farm is a small-scale organic market garden sitting on a quiet back-channel of the Trent River. We grow over fifty varieties of vegetables, herbs, and flowers with care and mostly hand tools. Established in 2012, Knuckle Down started on land borrowed at reroot organic farm. In 2014 we moved to our very own farm near Frankford, Campbellford, and Stirling Ontario. Jenny took a somewhat circuitous route to farming. Helping out at a friend’s farm on a cold, rainy day, she realized that despite being exhausted, shivering, and covered in mud she was happier than when at a desk. Her academic background in Environmental Studies (B.E.S.) and Environmental Design (M.E.Des.) made the decision to farm organically an obvious one and she has been doing so full-time since 2010. 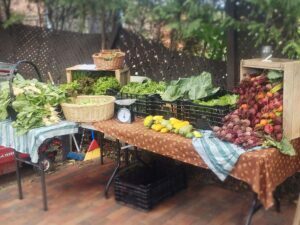 Community Supported Agriculture (CSA) shares give you a direct connection to the local farm where your vegetables are grown and with the farmer who grows them. They also give you fresh, delicious, organic produce all summer. By buying shares of the future harvest while the ground is still frozen, you allow us to purchase the seeds and equipment needed in the spring. Once the season begins, usually by mid-June, we harvest fresh vegetables for you to enjoy each week. Shareholders thus agree to share the risks as well as the bounty of the harvest, allowing farmers to focus on growing. SMALL SHARES are intended to feed two omnivores or one very dedicated vegetable eater. REGULAR SHARES are intended to feed four omnivores or two very dedicated vegetable eaters. One of the most exciting things about growing our own food is that we can choose from thousands of varieties of vegetables most of which will never be found in a grocery store. At Knuckle Down Farm we grow everything from organic seed and be they rare and unusual, heirlooms or familiar favourites we are always looking for varieties with the best flavour. Each week we try to provide a good balance between old standards and something new and interesting. The shares change with the season, however we do our best to make sure each week has something for everyone. Sign-up now for 20 weeks of delicious vegetables grown just for you right here at Knuckle Down Farm. Spring, Summer and Fall you can find us at the Dufferin Grove Organic Farmers’ Market in Toronto every Thursday between 3pm and 7pm. From May to October you will also find Kate at the Campbellford Farmers’ Market every Saturday from 8am till noon.